Background The implementation of an electronic health record (EHR) with structured and standardized recording of patient data can improve data quality and reusability. Whether and how users perceive these advantages may depend on the preimplementation situation. 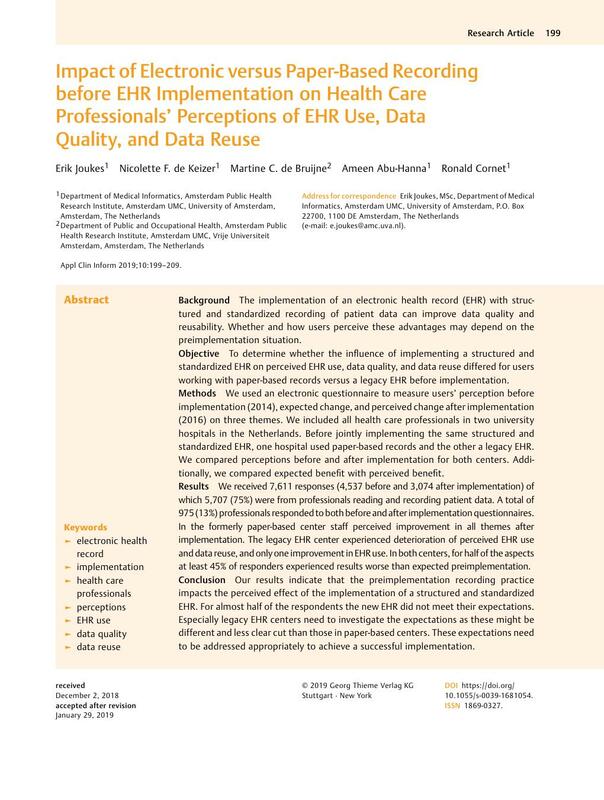 Objective To determine whether the influence of implementing a structured and standardized EHR on perceived EHR use, data quality, and data reuse differed for users working with paper-based records versus a legacy EHR before implementation. Methods We used an electronic questionnaire to measure users' perception before implementation (2014), expected change, and perceived change after implementation (2016) on three themes. We included all health care professionals in two university hospitals in the Netherlands. Before jointly implementing the same structured and standardized EHR, one hospital used paper-based records and the other a legacy EHR. We compared perceptions before and after implementation for both centers. Additionally, we compared expected benefit with perceived benefit. Results We received 7,611 responses (4,537 before and 3,074 after implementation) of which 5,707 (75%) were from professionals reading and recording patient data. A total of 975 (13%) professionals responded to both before and after implementation questionnaires. In the formerly paper-based center staff perceived improvement in all themes after implementation. The legacy EHR center experienced deterioration of perceived EHR use and data reuse, and only one improvement in EHR use. In both centers, for half of the aspects at least 45% of responders experienced results worse than expected preimplementation. Conclusion Our results indicate that the preimplementation recording practice impacts the perceived effect of the implementation of a structured and standardized EHR. For almost half of the respondents the new EHR did not meet their expectations. Especially legacy EHR centers need to investigate the expectations as these might be different and less clear cut than those in paper-based centers. These expectations need to be addressed appropriately to achieve a successful implementation. The study design for both participating centers was submitted to the ethics committee of the Academic Medical Center, Amsterdam, and was exempt from review (W14_088 # 14.17.0114 and W15_339 # 15.0394).